May 4, 2015 – Using a 10-ton crane, Lockheed Martin engineers and technicians gently lowered the system module of the U.S. Air Force’s first next generation GPS III satellite into place over its propulsion core, successfully integrating the two into one space vehicle. GPS III space vehicle one (SV 01) is the first of a new, advanced GPS satellite design block for the Air Force. GPS III will deliver three times better accuracy, provide up to eight times improved anti-jamming capabilities and extend spacecraft life to 15 years, 25 percent longer than the satellites launching today. GPS III’s new L1C civil signal also will make it the first GPS satellite interoperable with other international global navigation satellite systems. The systems integration event brought together several major fully functional satellite components. The system module includes the navigation payload, which performs the primary positioning, navigation and timing mission. The functional bus contains sophisticated electronics that manage all satellite operations. The propulsion core allows the satellite to maneuver for operations on orbit. 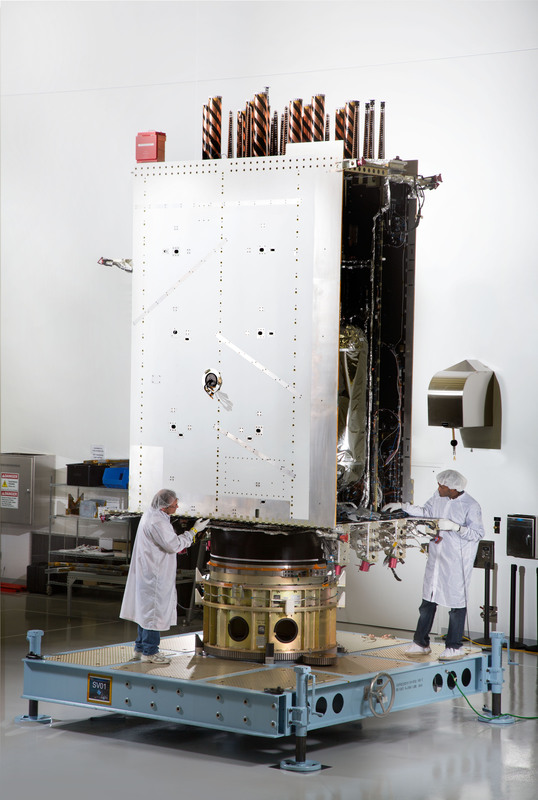 Lockheed Martin is currently under contract to build eight GPS III satellites at its GPS III Processing Facility near Denver, a factory specifically designed to streamline satellite production.